Nearly a year has passed since Amani and the rebels won their epic battle at Fahali. Amani has come into both her powers and her reputation as the Blue-Eyed Bandit, and the Rebel Prince’s message has spread across the desert – and some might say out of control. But when a surprise encounter turns into a brutal kidnapping, Amani finds herself betrayed in the cruelest manner possible. Thank you to NetGalley for sending me an eArc of this book. This is a spoiler-free review of Traitor to the Throne, however, it does include spoilers for Rebel of the Sands! Traitor to the Throne is the highly anticipated sequel to Rebel of the Sands. Having loved the first book in this series when I first read it, I was quite excited for the release of the second book in this trilogy. However, I have to admit that I feel slightly let down by Traitor. I feel as though, in my opinion, the biggest let down in this book (compared to Rebel) was Amani’s drastic character change. I’m all for character growth and development, but that wasn’t what this was. After discovering her Demdji heritage in Rebel, Amani seems to now be completely reliant on her magic and brings it into absolutely everything in this book. I much preferred the gunslinging sharpshooter version of Amani from the first book. Traitor also seemed to bring a few plot holes to light – for example, at one point, Amani comments that she is unable to make a sarcastic comment (as, being a Demdji, she physically can’t lie) and “her tongue can’t tell the difference between sarcasm and lying”. However, Amani’s entire personality in Rebel was based around her sassiness and sarcasm? I don’t want to sound too picky so I won’t go into detail, but I noticed a few little things like this that just didn’t quite make sense to me when you take the first book into consideration. Now, I’ll stop slating Amani and move onto a big issue I had with the plot. Skip this section if you want to avoid very mild spoilers! So basically, Amani spends the majority of this book inside the Sultan’s harem after being kidnapped and sold to him, as he is looking for a Demdji. She slowly manages to gain more of his trust, and there is a point where she starts to have clear doubts about Ahmed’s ability to rule and about the rebellion in general. However, these doubts are voiced by her and then just never dealt with again? Fair enough if it was just a moment of doubt and she didn’t take it too seriously, but I would have liked to have read how she worked through that. Plus, anyone who knows me knows that I am in no way going to support a tyrannical character, but apart from a few things, the Sultan didn’t seem too awful. Like, I’ve seen fictional dictators who are far more evil. Ahmed is barely in this book, but he’s pretty insufferable in the scenes he is in, and to be honest, he just isn’t that good a good leader. Why is Shazad not leading this rebellion? Yes, she’s not royalty, but surely rebellion is just slightly about overthrowing imperialism. Shazad would be a far better ruler than any of the men in this book. I’m rooting for #ShazadforSultan2018. Anyway. The political intrigue – of course I like action, but a bit of intrigue is never a bad thing in my opinion! The little myths and legends inserted between chapters every now and then! Not only were they intriguing, but they were beautifully written and really helped to build the story. I think more of these in book three would go far. There’s very little romance – the plot is almost entirely focused on the plot, and therefore on the rebellion and politics. Although I don’t dislike Jin and Amani as a couple, and I didn’t really see the point in her basically being mad at him for almost this entire book, I was glad that the romance was put to one side for a while. Shazad, Rahim and Sam. Three characters I really liked in this book and really hope will be around more in book three. The Sultan. I love a good grey-area villain; this guy is clearly in the wrong in some aspects, but you can’t fully disagree with his ideas, and he clearly has an interesting back story. 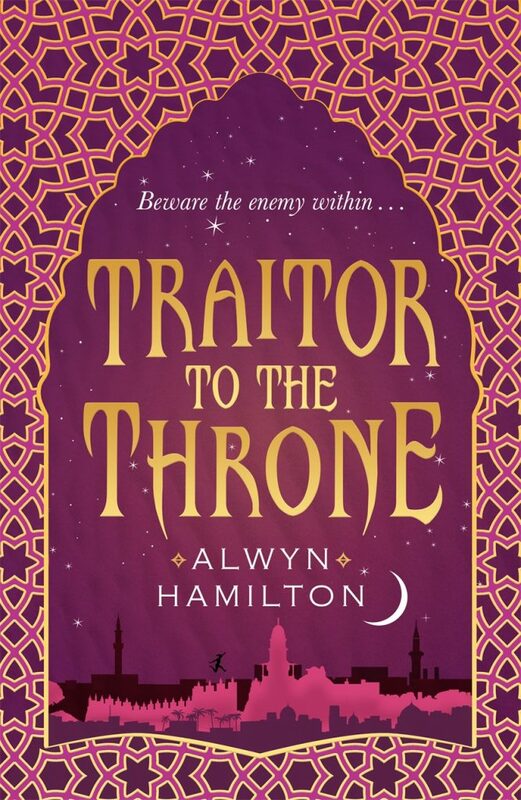 Traitor to the Throne is published on the 2nd February in the UK / 7th March in the US. Isn't the biggest plot hole the one about Lord Bilal being able to live longer if he married a Demdji? Wouldn't that mean that if a human married a Djinni that person would become immortal? At one point Amani's father says that if he took her mother as a wife she would only live for a few years and then die. What do you think?